Laboratory for Bioinformatics and Computational Chemistry, Vinča Institute, organized two-day workshop on the analysis of genomic Big Data with Galaxy platform. In the workshop, held at the January 17-18, participated fifty professors and researchers from universities and institutes from Serbia, as well as students of the Faculty of Biology, University of Belgrade. Lecterures and trainers were distinguished members of Galaxy community from Germany, Dr Björn Grüning, leader of the Freiburg Galaxy project, Dr Bérénice Batut, leader of the Freiburg Galaxy training program, and Helena Rasche, expert in the genome annotation, administrationd and development of Galaxy. Training enabled participants to get introduced to Galaxy platform and to do basic analisys of ChIP-seq and RNA-seq data. 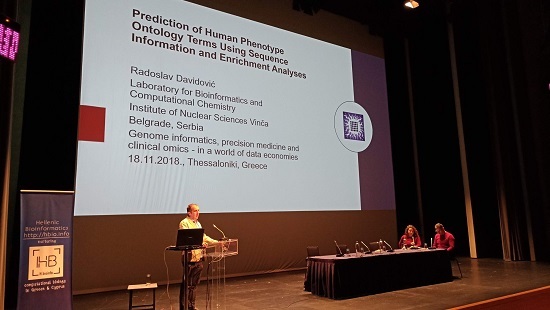 Rajko participated at the Hellenic Bioinformatics conference (Hbioinfo2018), held during November 15-18th in Thessaloniki, Greece. He gave invited talk, titled "Prediction of Human Phenotype Ontology terms using sequence information and enrichment analyses". 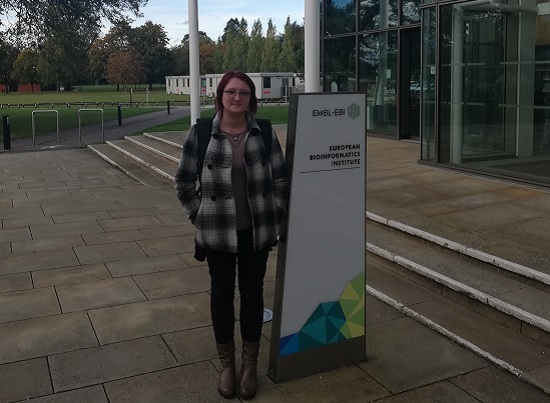 Branka participated at the MC meeting of the GREEC COST Action, held at the EMBL-EBI institute in Hinxton, UK. During October 1-2, she participated in the workshops dedicated to the biological ontologies and text mining. During her visit to the EMB-EBI, Branka visited Dr Alex Bateman, head of Protein Sequence Resources of the EMBL-EBI. Milica Aleksić successfully defended her graduation thesis at the Department for Chemistry, Biochemistry and Environmental Protection, University of Novi Sad, entitled: "Applying bioinformatics methods to predict cellular localization of proteins in mitochondria", which was done in our Lab. Milan got scholarship from Estonian National scholarship programme for academic staff and researchers. 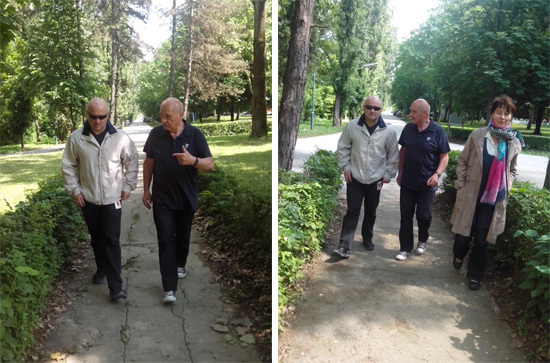 He spent three weeks in the Institute of Chemistry, University of Tartu, Estonia, working with Dr Alfonso Garcia-Sosa. He was working on drug repurposing in the selection of novel cardioprotective and multi-targeting compounds. 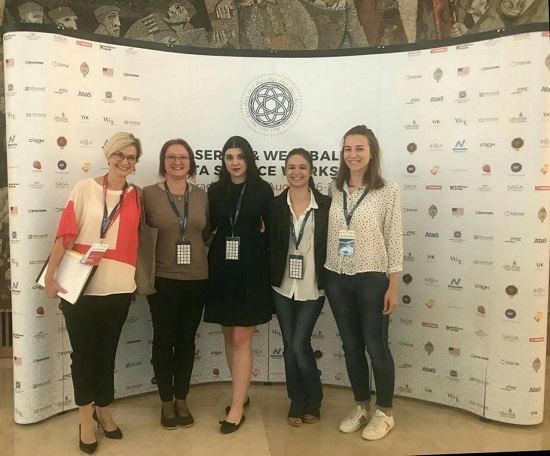 Katarina, Emilija, Tamara and Branka presented research performed in our Lab during poster session at the US-Serbia & West Balkan Data Science Workshop. Vlada gave a talk "Automatic annotation of the human proteome: Prediction of protein-protein interactions and disease phenotype associations", during Biomedical Informatics track at the US-Serbia & West Balkan Data Science Workshop. 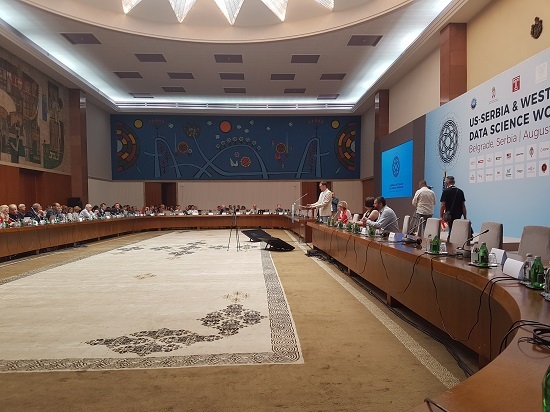 Nevena participated in the organization of the US-Serbia & West Balkan Data Science Workshop, held at Palace Serbia in Belgrade, August 26-28. 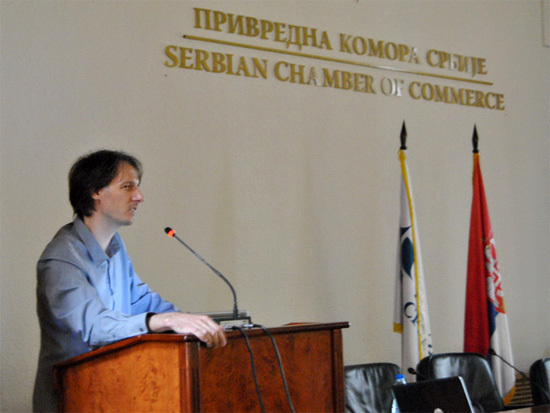 The workshop was organized by the National Science Foundation (NSF) with the aim to explore possibilities of US – Serbia & West Balkan cooperation in the data science field. Nevena co-chaired Biomedical Informatics track and chaired and moderated Panel on international and interdisciplinary collaboration. Ana Vuković successfully defended her master thesis at the Faculty of Biology, University of Belgrade. Title of the thesis is "Epistatic interactions of genetic variants related to benign hyperplasia of prostate in Serbian population". The research was done in our lab under Vlada’s supervision. Prof. Milka Vrecl Fazarinc from Veterinary faculty, University of Ljubljana, visited our Centre from June 18-22, 2018. During her visit we were working on the article regarding in silico and experimental research on nanobody derived peptides, discussed possibilities for further cooperation and presentedjoint poster at the Belbi 2018 Conference. There was a special session on the non-globular proteins held on the June 20th, within the BelBi 2018 conference. During this session there were six talks and the plenary lecture was held by Prof. Burkhard Rost. Detailed program is here. Session was supported by the COST Action BM1405, while the organizers were Nevena and Prof. Pavlović-Lažetić and Prof. Mitić from the Faculty of Mathematics, Belgrade University. 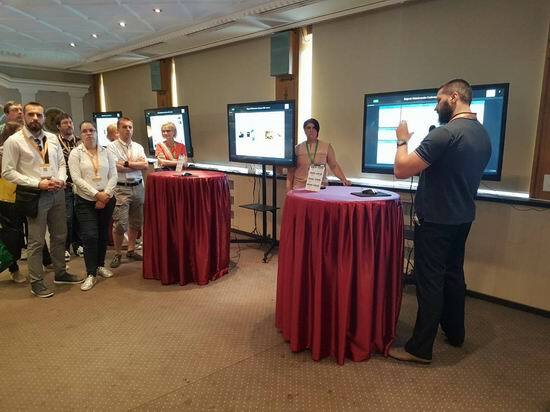 Our Center participated at the BelBi 2018 conference, held during June 18-22 in Belgrade. We had two talks: Vlada had a presentation entitled "Prediction of Human Phenotype Ontology Terms For Intrinsically Disordered Proteins", and Rajko’s talk was "DiNGO: stand-alone application for GO and HPO term enrichment". Also, our associate Ana Vuković had a presentation "Higher-order genetic interactions in prostate cancer and benign prostatic hyperplasia". 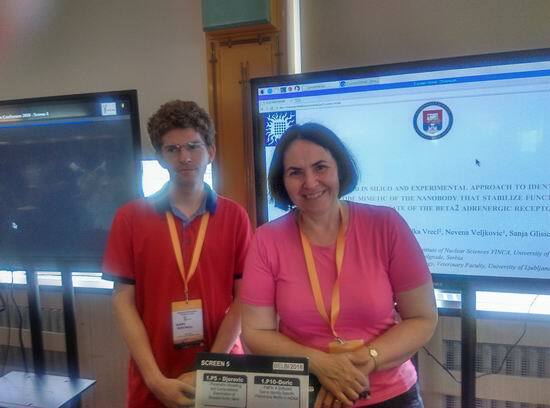 Neven, Milan and Branka presented results during poster sessions. 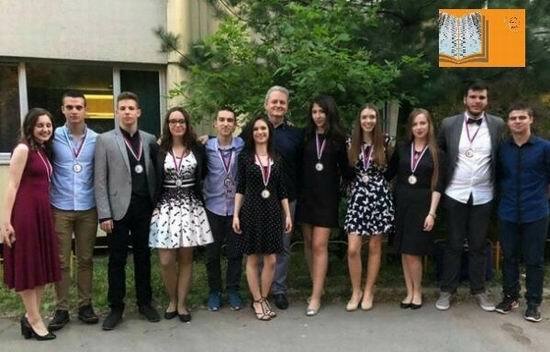 Katarina Stanković, a graduate at the Mathematical Grammar School, won a gold medal on the International Conference for Young Scientist (ICYS), held in Belgrade, in the area of Computer Science. She presented a research done in our Center, titled "Functional annotation of proteins: application on MYBL2, a gene involved in the onset and progression of cancer". 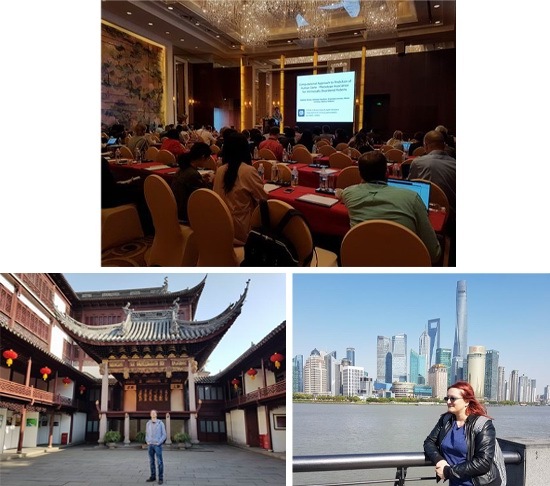 Vlada and Branka attended the Biocuration Conference in Shanghai, China. Vlada had a talk on the subject of "Computational Approach to Prediction of Human Gene - Phenotype Association for Intrinsically Disordered Proteins". Branka presented a poster titled "Function Annotation Algorithm Based on Sequence Spectral Features: Application on Human Transcription Factors". Katarina won second place in the area of Informatics at the National scientific competition for high-schools students, organized by the Regional center for Talents. She presented research "Functional annotation of proteins: Application on MYBL2, a gene involved in the onset and progression of cancer", performed in our Center. Milan attended the "Computational Methods in Drug Design" Training School in the frame of COST Action CM1406 (EPICHEMBIO). The event took place at Kadir Has University in Istanbul, 22-24 March 2018. Sanja attended the COST Action CM1407 5th MC/WG meetings on Malta, held at March 1-2, 2018. She presented the collaborative poster entitled: "In silico screening of database of natural products for the selection of dual HIV reverse transcriptase and integrase candidate inhibitors." Vlada participated at the NGP-net Workshop on Structural and Functional Tandem Repeat Regions in Proteomes, 19-21 st February, in Montpellier, France. 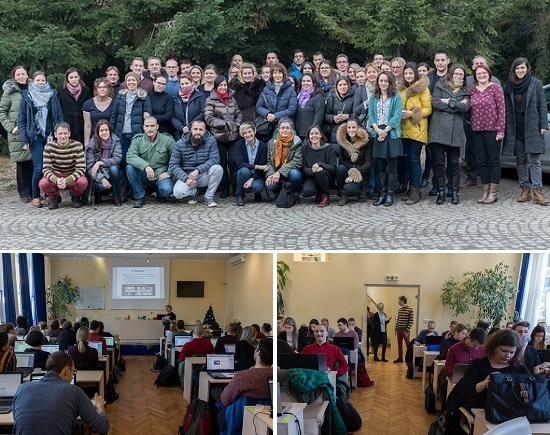 Branka participated at the GREEKC workshop "The Nuts and Bolts of an Interoperable Knowledge Commons", 12-14 February 2018, held at the Faculty of Medicine, Ljubljana, Slovenia. 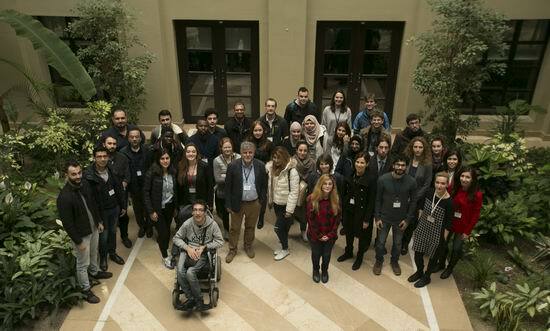 Rajko participated at the 2nd NGP-net Winter School on Computational Methods for Non-Globular Proteins, 09-12 January 2018, Nicosia, Cyprus. On the occasion of the World Day Against HIV/AIDS in Vračar municipality on December 1, 2017, an educational lecture on the role of physical activity in the prevention of infectious and chronic diseases was held. The gathering was opened by the President of the City Municipality of Vračar, Prof. Dr Milan Nedeljković, followed by a lecture titled "Physical Activity in the Prevention of HIV and Cancer" held by Prof. Dr Milivoj Dopsaj from the Faculty of Sport and Physical Education of the University of Belgrade and Dr Sanja Glišić from the Center for Multidisciplinary Research at the Institute Vinča. 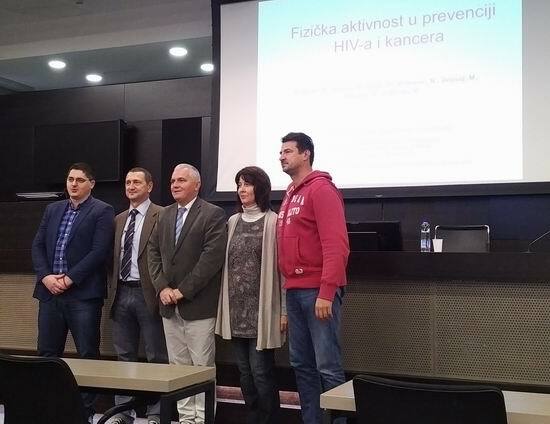 The aim of this lecture was to promote the results achieved by researchers from Institute Vinča in cooperation with colleagues from the Faculty of Sport and Physical Education of the University of Belgrade, the Faculty of Pharmacy at the University of Belgrade and the Italian National Institute for Cancer CRO, referring to the molecular mechanisms on which it is based the protective action of the physical activity against HIV and cancer. 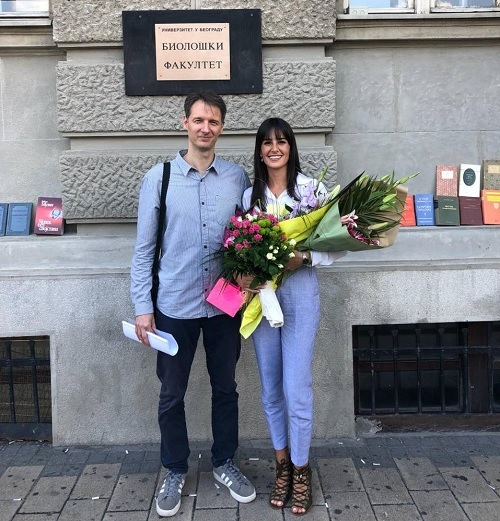 Tamara Drljača successfully defended her master thesis at the Department for Biology and Ecology, University of Novi Sad, entitled: "Mapping of protein-protein interactions of estrogen receptors alpha and beta and progesterone in breast cancer", which was done in our Center. Branka participated at the Training School "Knowledge Commons and Tools interoperability", within COST action "GREEKC: Gene Regulation Ensemble Effort for the Knowledge Commons". Veljko and Sanja attended the 4 th WG/MC meeting of the COST action CM1307 "Targeted chemotherapy towards diseases caused by endoparasites", in Lausanne, 25-27 October 2017. Sanja had a presentation "Leishmaniasis - possibilities for drug repurposing". 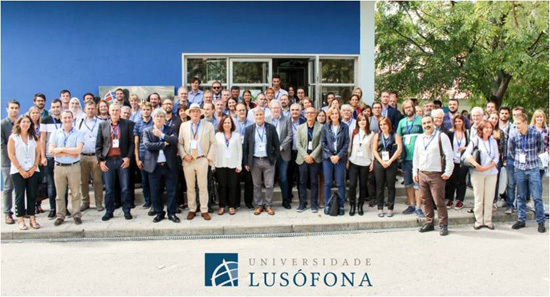 Sanja attended the 4 th WG/MC meeting of COST action CM1407 "Challenging organic syntheses inspired by nature - from natural products chemistry to drug discovery", in Lisbon, 21-22 September 2017. She presented research entitled "In silico screening of spices with possible anti-HIV ingredients". Nikola Nonković successfully defended his master thesis at the Faculty of Biology, University of Belgrade, entitled: "Estimation of the risk for prostate cancer occurrence in Serbian population based on the detection of epistatic interactions of genetic variants", which was done in our Center. 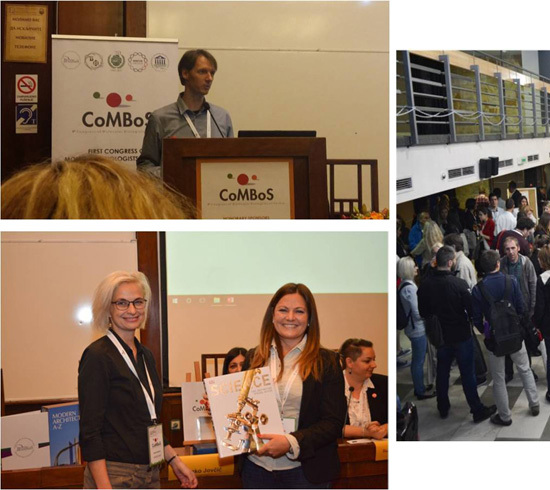 Vlada had an invited talk at the first Congress of Molecular Biologists of Serbia (CoMBoS), titled: "Annotation of the Functional Impact of Coding Genetic Variants". The talk was published in full in the Biologia Serbica, 2017, 39(1): 74-82. Rajko participated in the poster section, with the poster: "MethSpec: a computational tool for evaluation of methylaton specific PCR primer specificity". Nevena was a member of the program committee of the first CoMBoS. Additionally, she was a chair of the poster section BIOMEDICINE and had a great pleasure to hand the award for the best poster. 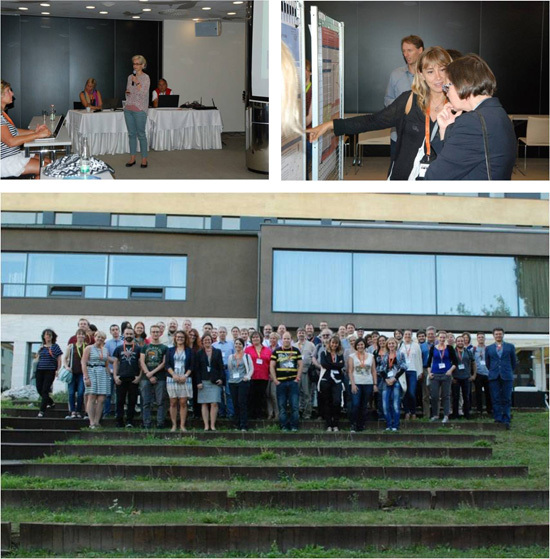 Nevena and Vlada participated at the third NGP-Net Symposium on non-globular proteins in Košice, Slovakia. Nevena had oral presentation, titled: "IDP PPI prediction method based on various sequence representations", and Vlada had a poster "Improving a machine-learning approach for determination of genuine tandem repetitive sequences with enclosure of Fourier-based features", co-authored by Nevena, Neven and Andrey Kajava (University of Montpellier). 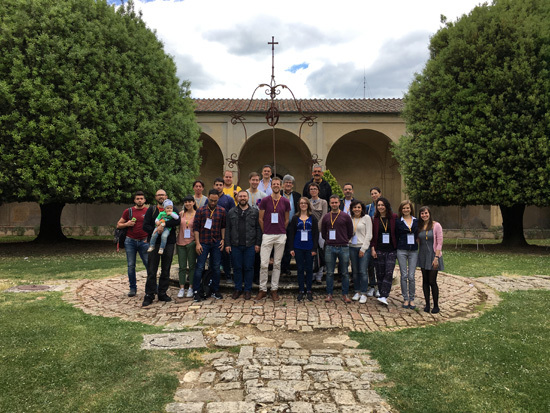 Strahinja attended COST1307 Action 2nd Training School "Anti-parasitic drug design and screening in silico" in Certosa di Pontignano, Italy. He presented his research project "Study of leishmanial type II NDH2 dehydrogenase inhibition mechanism using molecular dynamics." co-authored by Milan Senćanski, Sanja Glišić, Mattia Mori and Professor Maurizio Botta. Training School started 19th and ended 21st of May. Vlada had an invited talk at the Belgrade International Molecular Life Science Conference for Students (BIMLS), Serbian Chamber of Commerce, Belgrade 4-7 April 2017. His speech was titled "Big data in biology". 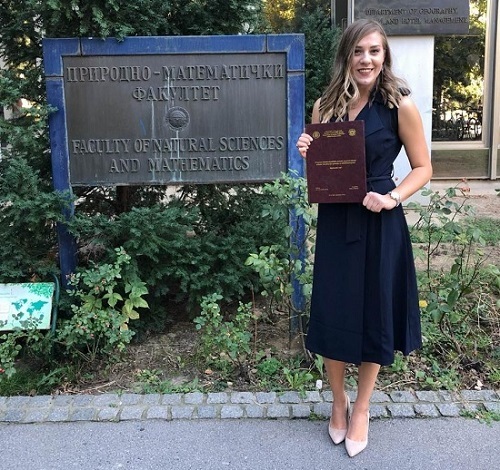 Emilija Jovanović won silver medal in the International Conference of Young Scientists (ICYS 2017) in Stuttgart, Germany with the research work "Bioinformatics analysis of ASXL1 protein mutations, important biomarkers of myeloid malignancies", performed in our Centre. With the same research, Emilija won first prize in the national competition of research papers of highschool students, organized by Regional Center for Talents. Strahinja was awarded with a grant for Short Term Scientific Mission, in the frame of COST Action 1307: Targeted chemotherapy towards diseases caused by endoparasites. He spent one month at the University of Siena, department for Biotechnology, Chemistry and Pharmacy, under supervision of Prof. Maurizio Botta and Dr. Mattia Mori. The title of his research was "Study of leishamnial type II NDH2 dehydrogenase inhibition mechanism using molecular dynamics (MD)". 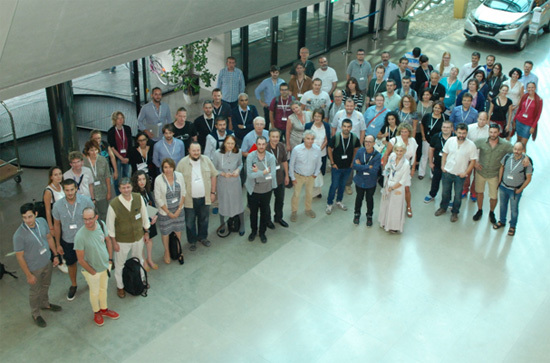 Rajko attended NGP-net Winter School on Experimental Methods for Protein Disorder & Aggregation in Marseille, France. It was held at the Architecture et Fonction des Macromolécules Biologiques (AFMB), from 13th to 17th February. Neven won a grant for Short Term Scientific Mission, as part of the COST Action BM1405: Non-globular proteins in molecular physiopathology. He spent 2 weeks in the Centre de Recherche en Biologie cellulaire de Montpellier, under supervision of Dr Andrey Kajava, working on "Improving a scoring tool for boundary determination between repetitive and non-repetitive protein sequences by using machine learning methods". Milan attended the 2nd MOLIM General Meeting in Dubrovnik from 10 to 12 October 2016. He had an oral presentation entitled "Theoretical Study of the Nature of S-π Interactions, Their Role in Activation Process of Dopamine D2 Receptor and Comparison with Se-π Systems" at the Young Scientists Forum. Branislava got the first time awarded "Stanka Romac Foundation" prize for the best PhD thesis in the research areas of human molecular genetics and biomedicine for 2014 - 2016. The Foundation was established in honour of prof. Romac who has given an exceptional contribution to the development of molecular biology and PCR diagnostics in Serbia. 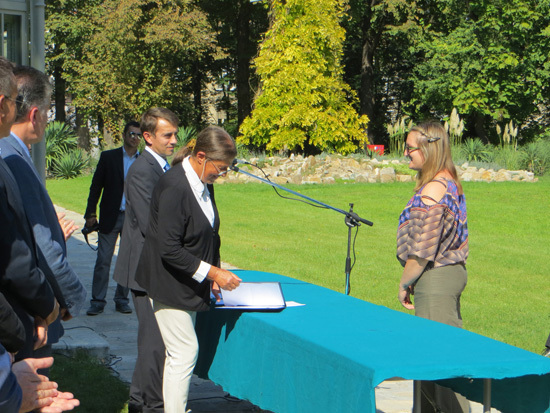 The prize was awarded at the celebration of the Day of the Faculty of Biology in the Botanical Garden "Jevremovac". Branislava attended the training school "In vitro evaluation of compounds with anticancer potential" held at the Institute for Biological Research Siniša Stanković. 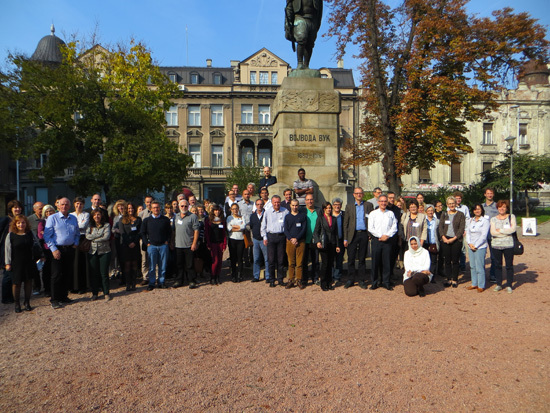 She presented a poster "Predicting protein function from sequence and co-expression: preliminary results for breast cancer molecular markers"
Nevena attended the Autumn GLISTEN 2016 conference and the COST Action CM1207 meeting in Prague. The conference took place in National Library of Technology on 26-27 September 2016. 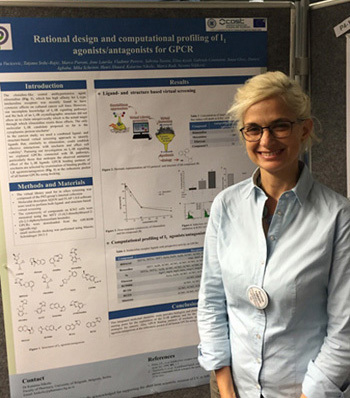 She presented the colaborative poster entitled: "Rational design and computational profiling of I1 agonists/antagonists for GPCRs". Center for multidisciplinary research was the organizer of the 2nd Symposium on non-globular proteins, NGP-Net 2016. The scientific program and book of abstracts can be find here. We participate in organization of the bilateral meeting entitled "Italy meets Serbia - Translational Cancer Research: the Use of Physics and Chemistry". 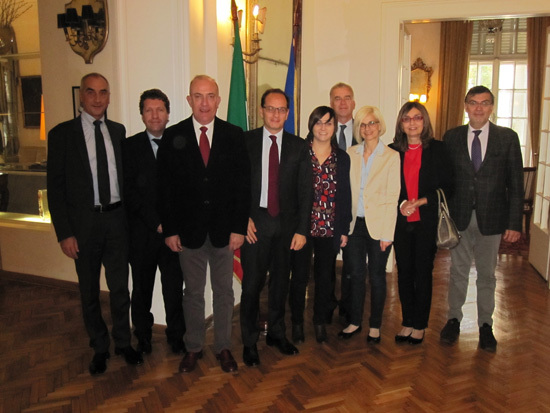 The intention of the meeting is to foster interactions between Serbian and Italian researchers in the field of life sciences with the aim to fight malignant diseases. The meeting will take place on October 28th 2015, at Palazzo Italia in Belgrade. Details about the meeting can be found here. 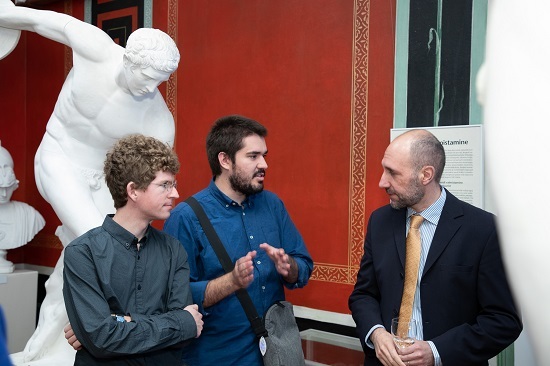 Ambassador of Italy in Belgrade Giuseppe Manzo and scientific attache Paolo Batinelli with participants of the event. We are organizers of the joint COST Action CM1307 2nd Conference and WG2 and WG3 Meetings on targeted chemotherapy towards diseases caused by endoparasites. The event will take place on October 26-28th 2015, at hotel Palace in Belgrade. For the meeting details see here. Sanja presented our work at the First CM1407 Action Meeting in Rome, Italy: "In silico screening of natural products for the selection of dual HIV CCR5/CXCR4 candidate inhibitors". 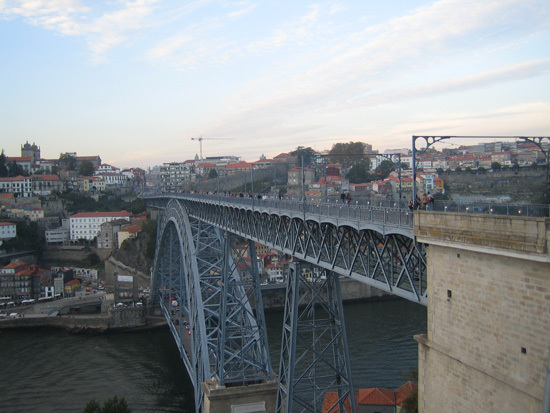 Ivana and Vlada presented our works at the First NGP-NET Symposium on Non-Globular Proteins in Porto, Portugal: "Novel phylogenetic algorithm to monitor human tropism in Egyptian H5N1-HPAIV reveals evolution toward efficient human-to-human transmission" and "Understanding Prions Using Sequence Spectral Features". Milan presented our work at the GLISTEN Amsterdam 2015 conference "Combined in silico approaches for selection of novel nociception receptor small molecule agents". Dr. Slobodan Paessler, an associate Prof. at Medical Branch of the University of Texas and director of Animal Biosafety Level 3, Institute for Human Infections and Immunity visited our Center and gave a lecture on his latest research. There were also many opportunities for networking and discussing future cooperation and joint projects. Poster created during Vinca's workshop "Leukemia from the computer biologist's view", held last year in our Center, won the first prize at the Vinca's Open door poster session. Authors of the poster are students Avdalovic A, Chalabi E, Jevremovic M, Kosijer P, Lazovic T, Nedeljkovic M and Savic N, mentored by Branislava Gemovic. Nevena gives an invited talk: "Long-range intermolecular interactions of neurotransmitters and neurotransmitter receptors" at the COST CM1103 ESR conference: "Computational Chemistry for Neurological Targets", on May 7, 2015. At the same conference, Milan gives a research presentation: "Combined in silico approaches for selection of potential ORL1 receptor ligands"
Oral defense of the PhD thesis of Branislava Gemovic, titled "Bioinformatics analysis of proteins involved in pathogenesis of myeloid malignancies", will be held on Friday April 3th 2015 at 1 pm in the library of the Institute of physiology and biochemistry, Faculty of Biology (Strudentski trg, 2nd floor). Commission for the oral defense is: Dr Nevena Veljkovic (Vinca Institute of Nuclear Sciences, mentor), Dr Dusanka Savic Pavicevic (Faculty of Biology, mentor), Dr Dragomir Marisavljevic (Faculty of Medicine), Dr Katarina Nikolic (Faculty of Pharmacy) and Dr Goran Brajuskovic (Faculty of Biology). Altmetric has tracked 3.195.911 articles across all journals so far. Compared to these, our article has done particularly well and is in the 97% percentile: it´s in the top 5% of all articles ever tracked by Altmetric. Veljko Veljkovic at Cro Aviano YouTube channel. We held a workshop 'Leukemia from the computational biologist's perspective' as part of the project for science popularization Vinca's scientific workshops. Seven high school students from Belgrade, Novi Sad, Ruma and Novi Pazar participated. Explaining how flu vaccines prevent heart attacks, Elsevier issued press release of our study in Vaccine.